Cleveland Land Services - nationwide specialist contractors providing plant hire & sales, and sports construction & landscaping services across the UK. 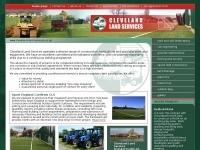 two profiles were found for Cleveland-land-services.co.uk in social networks. Among other social networks the website is represented in Facebook and LinkedIn. The web server with the IP-address 81.29.67.141 used by Cleveland-land-services.co.uk is run by DediPower Managed Hosting Limited and is located in Great Britain. The server runs exclusively the website Cleveland-land-services.co.uk. A Apache server hosts the websites of Cleveland-land-services.co.uk. The website uses the latest markup standard HTML 5. The website does not specify details about the inclusion of its content in search engines. For this reason the content will be included by search engines.